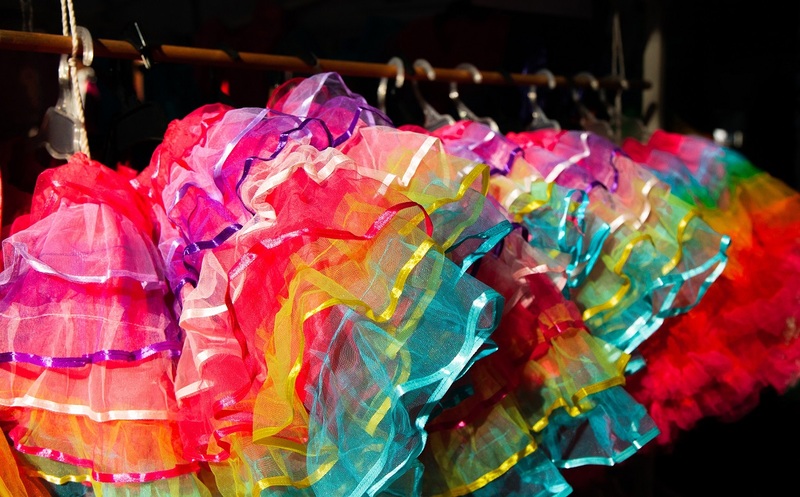 Also over on the blog today, learn how to create this tulle skirt from scratch! Yes, you can DIY your wedding dress! If you’re the crafty type, and you’ve got a good bit of ingenuity, you can find yourself walking down the aisle not in a mass-produced, factory-made wedding dress, but in your very own hand-sewn, custom-made original. Whether you’re upcycling, remaking, or sewing your wedding dress from scratch, check out these free wedding dress patterns and tutorials to get you started. 1. The DIY wedding dress process. Regardless of the fabric or style or pattern of wedding dress that you choose, THIS is the basic process that you’ll follow. Yes, it’s time-consuming, and yes, it can be tedious, but if there was ever a time for precision and perfection, then it’s when you’re DIYing your wedding dress. 2. Ball gown. Depending on your colorway, this dress would work equally well as a wedding dress or bridesmaid’s dress. 3. Boatneck dress. You might want to lengthen the skirt on this dress–or you might not! 4. Boning for a strapless wedding dress. Sometimes the main difference between a standard dress and a wedding dress is the construction; here, a tutorial on adding boning to a strapless dress shows you how to add structure to a standard pattern. 5. Cocktail dress pattern. A wedding doesn’t have to be the biggest production ever–perhaps all you want is a party, and all you need is the perfect cocktail dress. Here you go! 6. Crepe and chiffon wedding gown. 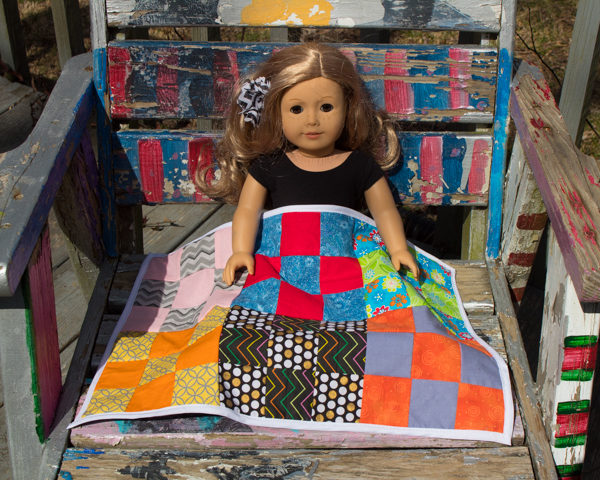 This is a versatile pattern that flatters a variety of body types and goes through a size 18. 7. Crinoline. Even if you don’t want to make your entire wedding dress from scratch, a crinoline is an easy way to add something you’ve sewn yourself to your garment. 8. Crochet wedding dress. If you can crochet, I REALLY think that you should crochet your wedding dress! 9. Dip-dyed wedding dress. Here’s a great way to remake a thrifted or upcycled wedding dress. Dip-dye it an interesting color! 10. DIY bustle. You don’t necessarily have to build your entire wedding dress from scratch; you can save money and achieve the dress of your dreams simply by doing some of the refashioning yourself. Here, for instance, is a DIY method to bustle the train on your wedding dress. 11. DIY dress form. Custom clothing is most easily sewn–especially for yourself!–with a custom dress form on hand. Here’s how to make a duct tape dress form that’s custom-built just for you. 12. Elastic-waist evening dress. I LOVE how comfortable this dress looks, while still fitting into a formal theme. To make it even comfier, it’s secretly a two-piece garment. 13. Goddess gown. This beautiful dress has little structure and lots of drape, and as such, won’t work for everyone, but if it works for you, it’s a great way to sew a dress that you really CAN use over and over again–and honestly, that’s a far more traditional way to make a wedding dress than the current way. 14. How to hem a formal gown. Even doing your own hemming of your wedding dress can give you more custom options, as it allows you to use a thrifted or off-the-rack dress without shelling out for alterations. This method of hemming is accessible to an intermediate sewer. 15. Laced-back dress. Here’s a pro tip for those of you who are looking for even more free resources for wedding dress patterns and tutorials–search for prom dress patterns and tutorials, too! Lots of people DIY prom dresses, so there are a lot more tutorials to choose from, and often those tutorials are for dresses that are both thrifty and adventurous. This lace-up back dress, for example, was built to be a prom dress, but would make a beautiful and fairly easy to sew wedding dress, as well. 16. Lace maxi dress. The pattern and style of this dress are deceptively conservative; it’s the use of lace that makes it an over-the-top wedding dress! If you’re a seasoned thrifted, keep your eye out for antique lace tablecloths to make your dress even more special. 17. Linen wrap dress. One of the best circumstances in which you can sew your own wedding dress is if you’re looking for something simple and understated. In that case, you can often DIY the perfect dress using a pattern that isn’t wedding-themed at all. This linen wrap dress, for instance, would be perfect for an outdoor wedding. Goood morning! How crazy is it that the first month of 2018 is almost already over another year that’s just going to flash by. To help you get through the week and procrastinate on whatever you should actually be doing to instead dream up little side projects I’ve just put up the latest DIY post on the journal! I came together with the beautiful woman behind @_thegreatstate to create this summer essential wrap dress. Was so nice to spend the day giggling, getting creative and catching up on life The steps to make this along with a little insight into the story behind @_thegreatstate is up on the journal. Right now. Find the link in my bio. 18. Off-the-shoulder wedding dress. This downloadable pattern for a simple, off-the-shoulder wedding dress comes in sizes small through extra-large. 19. Off-the-shoulder ball gown. Here’s another free, downloadable pattern for a dress that’s similar to the previous one, but has a fuller skirt and a more structured bodice–it’s your fairy tale wedding gown! 20. Ruffle wedding dress. Burdastyle patterns are the BEST! This particular Burdastyle creation is light and fluttery, with ruffles at the spaghetti straps. 21. Satin belt. A sash or belt is another DIY way to add definition to a non-standard wedding dress. 22. Sweetheart dress with a bubble skirt. You have to imagine this dress in white, but think of how well the strapless bodice and bubble skirt will look as a wedding dress. 23. Tulle skirt. Add this tulle skirt to a suitable top or sew it to a fitted bodice. 24. Just add lights. This hack works with any of the tulle or lace dresses above–for an evening wedding, why not add twinkle lights to your skirt? P.S. Want to skip the florist, as well? 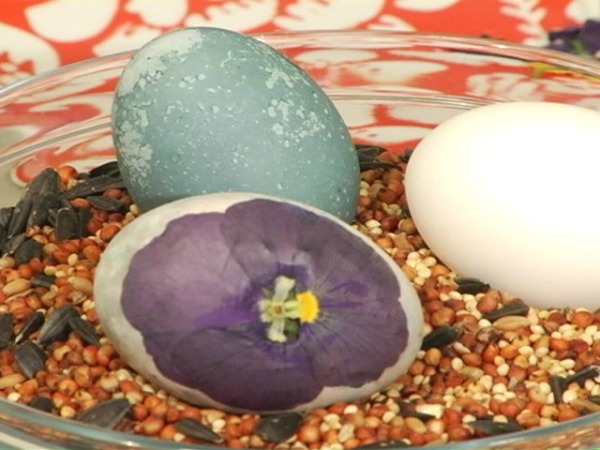 Check out these DIY, eco-friendly bouquets! ALL MY THINGS bring me joy. 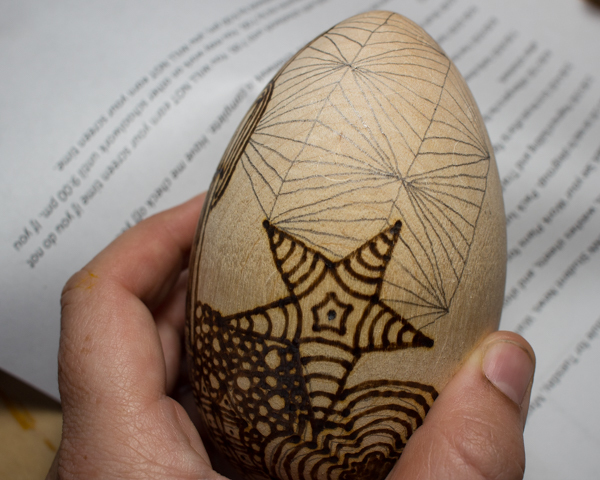 I am not giving up a single one of my priceless possessions, whether that possession is a dragon egg-themed Easter egg, a tiny skull-shaped bottle, a handmade polymer clay narwhal, or the name of my home state cut out of a license plate. Why do I have the name of my home state cut out of a license plate? Don’t remember. Don’t care. But I am KEEPING IT. As I’ve discovered, one’s priceless possessions look less like you’re a hoarder when they’re displayed nicely so that you can enjoy them, not piled up on top of your dresser gathering dust. Storing your little treasures nicely is as easy as arranging them in a shadow box, and making that shadow box is as easy as cutting and pasting. You learned how to do that stuff in kindergarten. You can totally do this. Why make a shadow box instead of buying one? Well, it’s cheaper, for one thing. And it’s better for the environment because these shadow boxes are made from corrugated cardboard and old papers, not particle board and plastic. And you will absolutely LOVE the way that you can customize each shadow box to have exactly the shape and the shelves that you want. Seriously, hot glue is a miracle of science. I think that these DIY shadow boxes look nice, and most importantly, they keep your stuff stored and on display so that you can enjoy it. 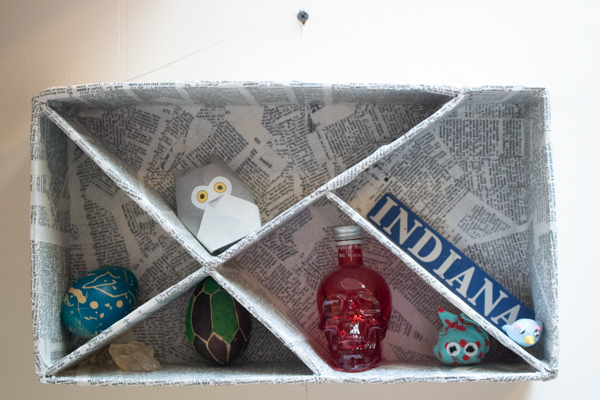 Check out how to make your own, and then get your own stuff off your dresser and displayed like you love it! Corrugated cardboard. 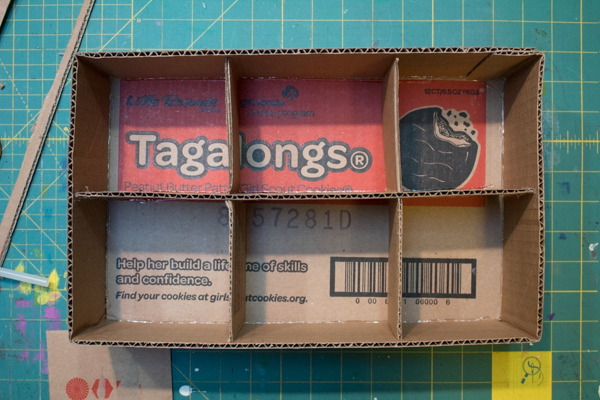 All of the cardboard that I’m using in this project comes from cases of Girl Scout cookies. Ask a Girl Scout of your own, and I’m sure she’ll be thrilled to offload some to you, too. Hot glue gun and hot glue. Paper. I’ve used old book pages, sheet music, comic books, and even plain newspaper for these shadow boxes. 1. Make the outside frame of the shadow box. Find a box whose area you like for your shadow box, and break it down and lay it flat on top of your self-healing cutting mat. You’ll be cutting the top and bottom off of the box, and then cutting it into a strip that will equal the depth of your shadow box. I really like three inches for this, although I used four inches for the shadow box that holds my friendship rocks and that depth works well, too. 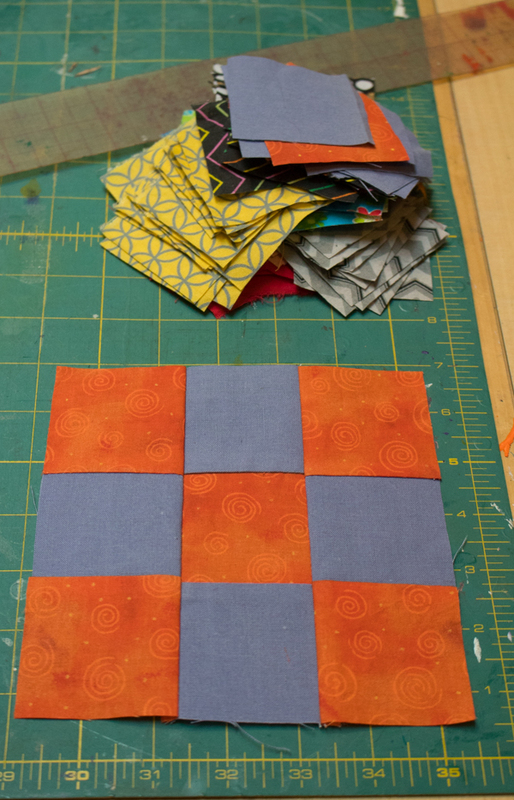 Open up the strip that you cut and stand it up on your cutting mat; this is the outside frame of your shadow box! 2. Add a back to the shadow box. 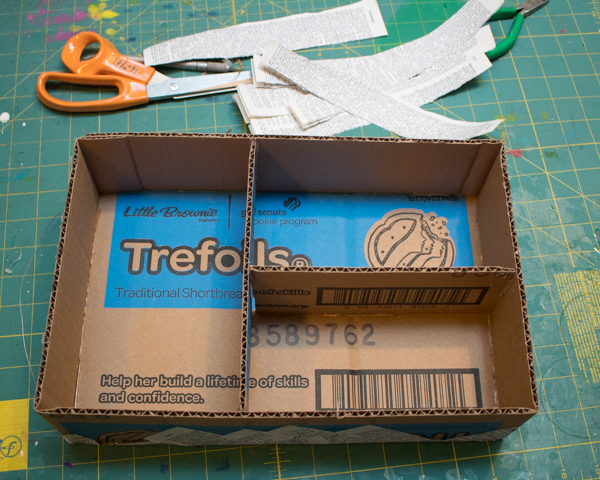 Set your shadow box frame on top of another piece of corrugated cardboard with at least the same area as the frame; if you’re using Girl Scout cookie cases, one of the larger sides of a second case is perfect for this. 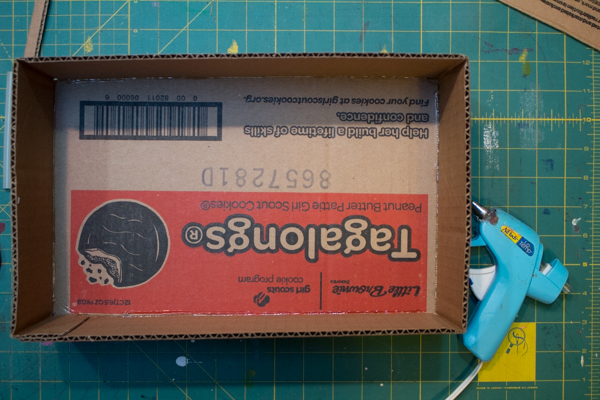 Hot glue the back to the frame all the way around, and then cut away any excess cardboard. 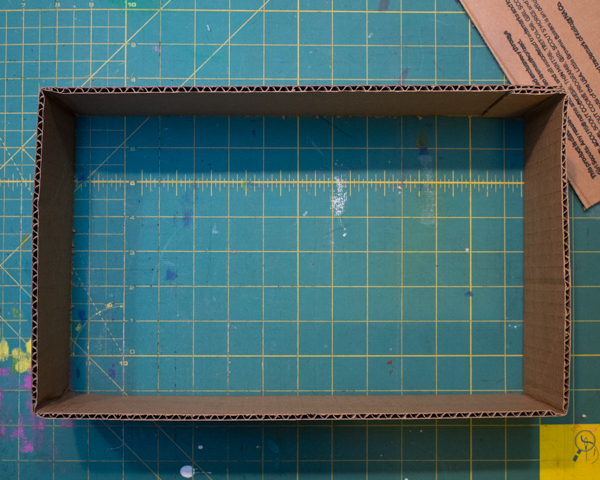 Cut more corrugated cardboard strips the same width as the shadow box frame, and then use those strips to add shelves to the shadowbox. Use hot glue to tack the shelves down, but you’ll be securing them much better a little later. 4. Add a hanging wire to the shadow box. Hot glue a length of wire or cording to the sides of the shadow box, making a loop that goes over the top of the shadow box for hanging. Don’t secure the hanging wire to the back of the shadow box (as I did on my very first attempt at making this project), because if you do, the shadow box will tend to tip forward when it’s filled and hung. Securing the wire to the sides of the shadow box will even out its balance a little better. 5. Decoupage the shadow box. If you liked the look of the raw cardboard, you could be just about done with your project there. I think these shadow boxes look nicer and are sturdier when decoupaged, however. To do this, choose a fun paper and tear it into strips. Pour a 1:1 mixture of white glue and water into a jar and stir it up. Piece by piece, dip a strip of paper into the mixture, strip off excess glue with your fingers, and smooth it onto the shadow box. Overlap as necessary to cover the entire surface area of the shadow box. I like to cover the back first, let it dry, and then cover the front. 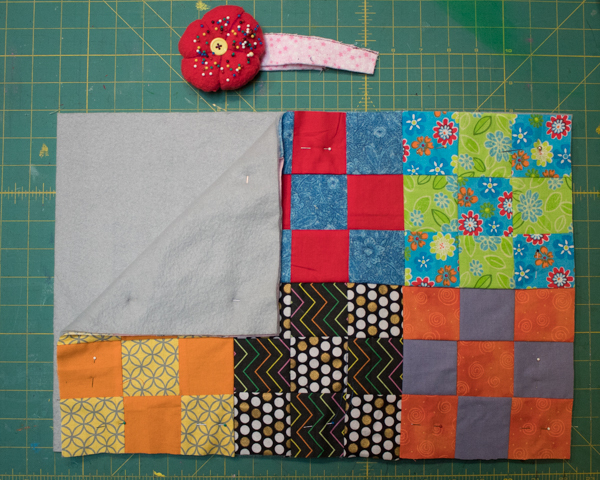 Covering the front will take a lot more time, as you use lots of paper to cover all those fiddly corners and seams. Let the glue dry well, and then you can paint or seal your shadow box if you wish. After that, it’s ready to be enjoyed! 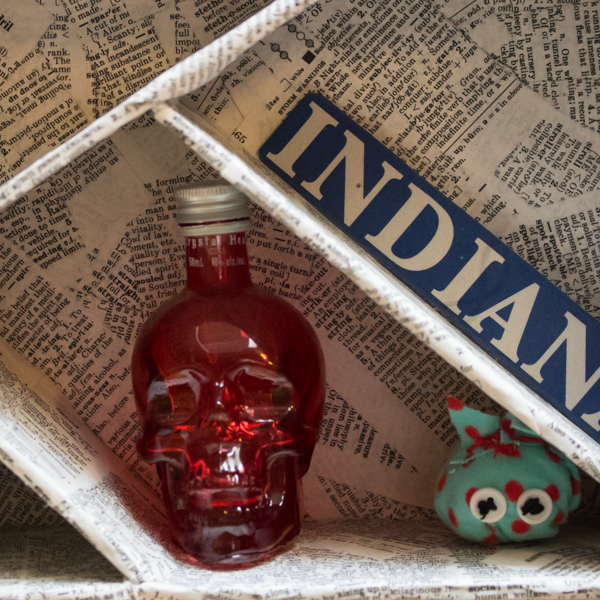 What will you display in your DIY shadow box? Let us know in the comments! Don’t let St. Patrick’s Day just be that overlooked holiday of binge-drinking. 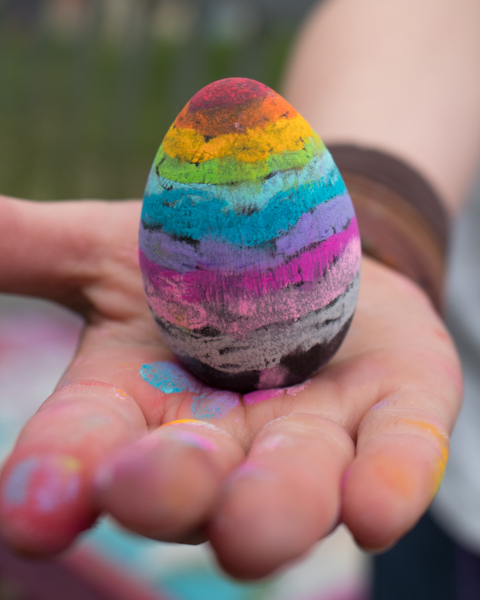 Instead, think of it as our first holiday of spring, our first excuse to add green to our decor, our permission to strew everything with rainbows and shamrocks. 1. Toilet paper tube shamrock. You know that here at CAGW, we’ve never met a toilet paper tube project that we didn’t love, and this one is no different. A toilet paper tube shamrock is quick and easy to make, and if you don’t already have everything that you need to make it, just wait a couple of days. 2. Fried eggs in green peppers. No matter what your St. Patrick’s Day plans are, you need a healthy, protein-filled breakfast to start you off. How about eggs fried inside green pepper shamrocks? 3. Paper shamrocks. Scrapbook paper is the perfect thickness to make these fun, three-dimensional paper shamrocks. 4. Scrap fabric wreath. 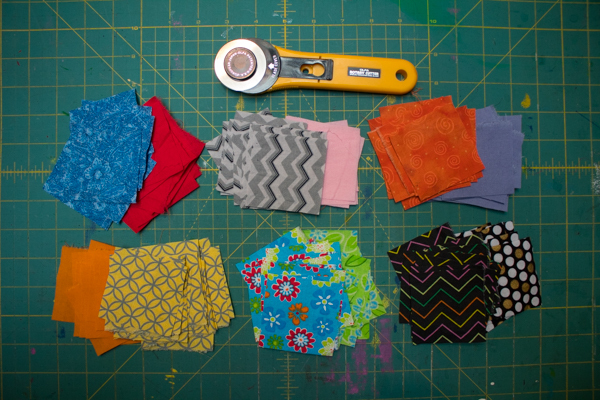 If you love to sew, it’s likely that you have more fabric scraps than you know what to do with. 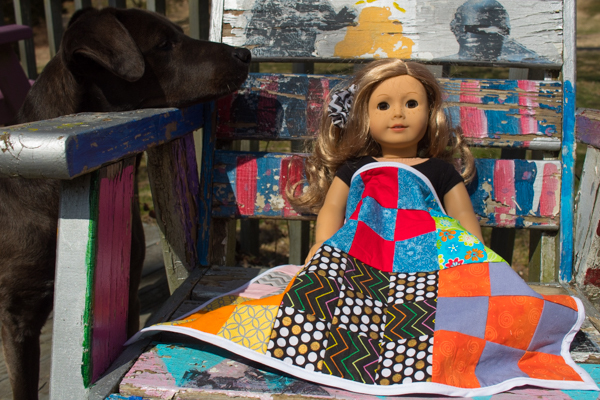 Are some of your fabric scraps green? If so, then I know what you should do with them! 5. St. Patrick’s Day gift tags. Giving something gold, rainbow-themed, or green? Add a gift tag with upcycled button embellishments to make it really festive. 6. Recycled St. Patrick’s Day garland. 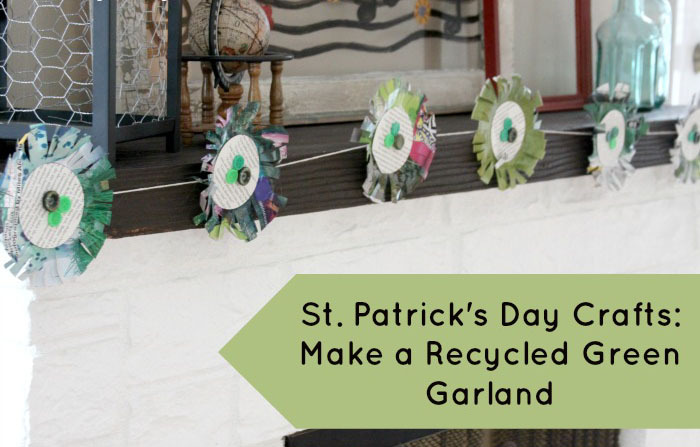 Your St. Patrick’s Day party will be even more festive with the right decorations, especially this St. Patrick’s Day garland made primarily from recycled materials. 7. Clay pot planters. 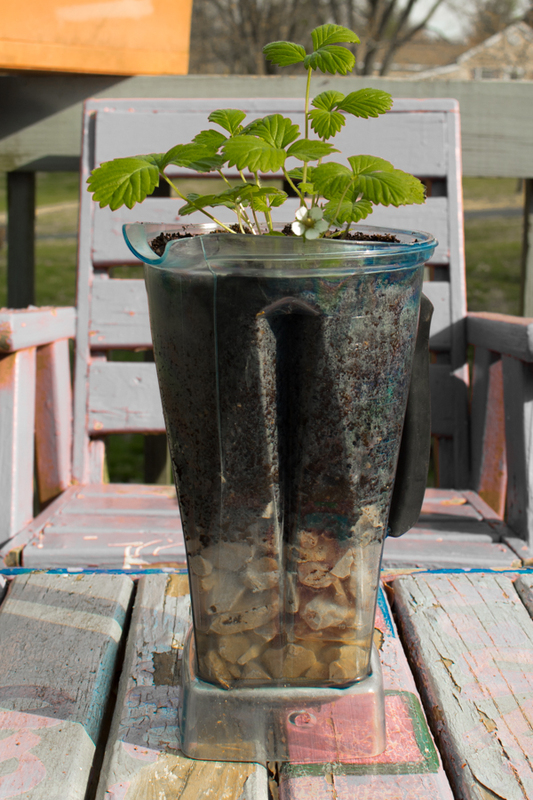 I LOVE the idea of starting greenery in these simply-embellished clay pots a couple of weeks before St. Patrick’s Day. How fun to finally have something green and growing to decorate with! 8. Embellished mugs. I highly recommend using real ceramics markers instead of paint pens, but other than that, embellishing thrifted white ceramic mugs, tea cups, and plates are one of my favorite craft projects. 9. Upcycled Mason jars. You CAN use Mason jars for this project, but I also really like to upcycle embossed spaghetti sauce jars. 10. Wood shim shamrock. 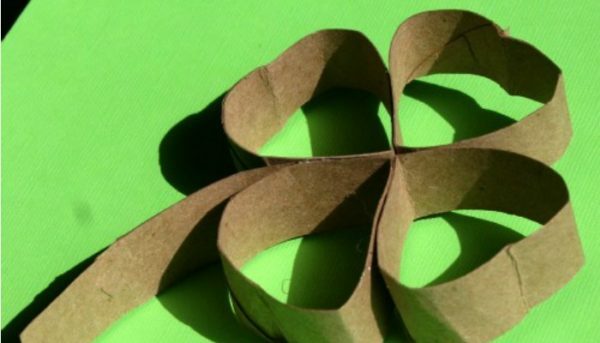 The tutorial calls for a pre-cut wooden shamrock as a base for the wood shim scraps, but you could cut the shamrock yourself out of scrap wood, or even use a sturdy cardboard base. 11. 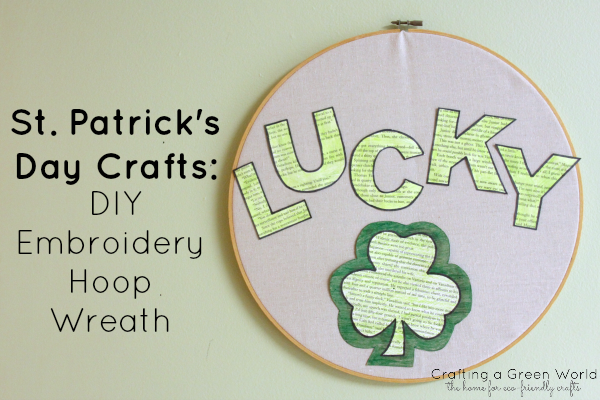 St. Patrick’s Day embroidery hoop wreath. Embroidery hoop wreaths are so simple to make and so easy to swap out. 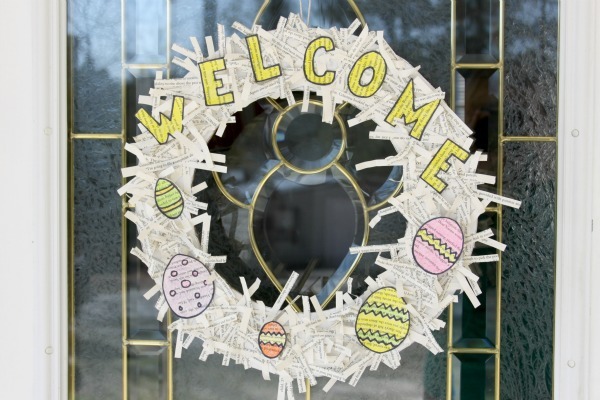 Change your Valentine’s Day wreath for St. Patrick’s Day, and then change it again for Easter! 12. LUCK marquee sign. The tutorial uses lath, but you could also upcycle pallet boards for this marquee sign. 13. Painted glass vases. A clear glass vase from the thrift store is easy to make look glossy and bright in any color you choose–in this tutorial, the color is three different shades of green. 14. Shamrock heart hair clips. Wool felt and Eco-fi recycled felt are both eco-friendly materials to use for this project. 15. Split pea wreath. It’s an unusual choice of material for a wreath, but since it’s green, it works! 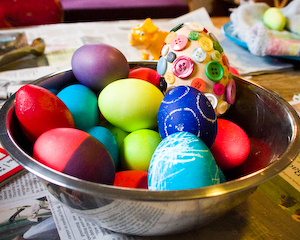 Use a straw or newspaper wreath base so that the whole thing is compostable after the holiday. 16. 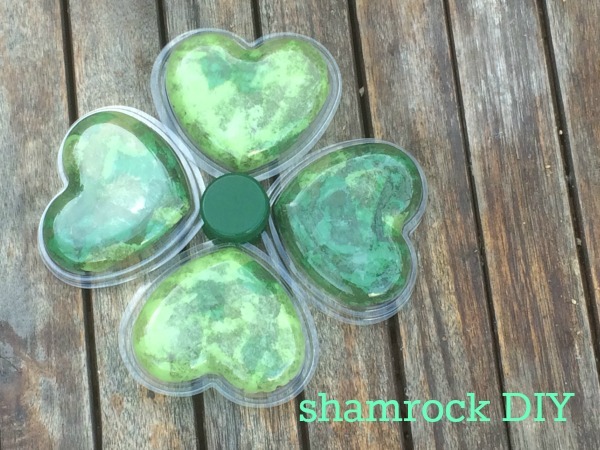 Valentine candy box shamrock. You know all those heart-shaped boxes of candy that you got for Valentine’s Day? Glue them together, paint them green, and just like that you have a shamrock! 17. Homemade rainbow rocket pops. Eat the rainbow in a good way, without all the sugar of a store-bought popsicle. 18. LUCKY penny letters. Don’t bother purchasing store-bought letters; instead, cut them from cardboard or scrap wood. 19. Scrap wood leprechaun hat. Crafting with scrap wood is one of my favorite things because it’s so cheap and eco-friendly, and glue and paint can do anything. Here, it makes a fun and festive leprechaun hat! 20. Split pea hurricane lamps. It turns out that EVERYONE is using dried split peas to decorate for St. Patrick’s Day! Here, they serve as a rest for the candles in hurricane lamps. 21. Recycled shamrock brooch. Obviously, you have to wear green on St. Patrick’s Day. 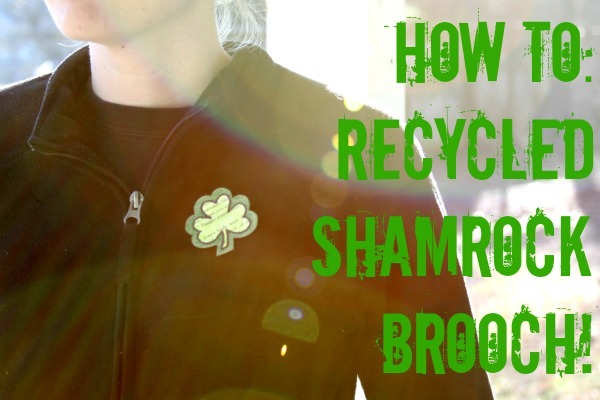 Here’s a DIY shamrock brooch whose materials you can pull from your recycling bin. 22. Paper mosaic shamrocks. 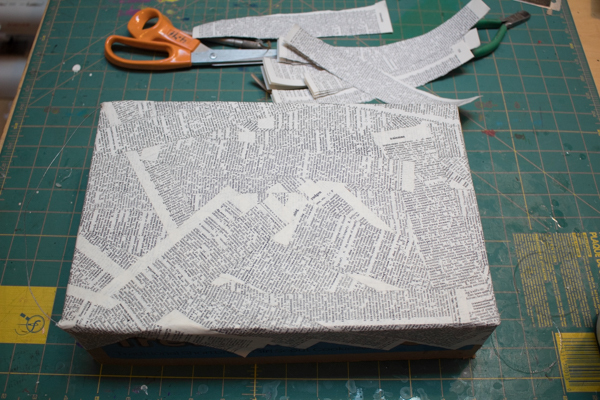 Here’s a great way to use up lots of paper scraps. 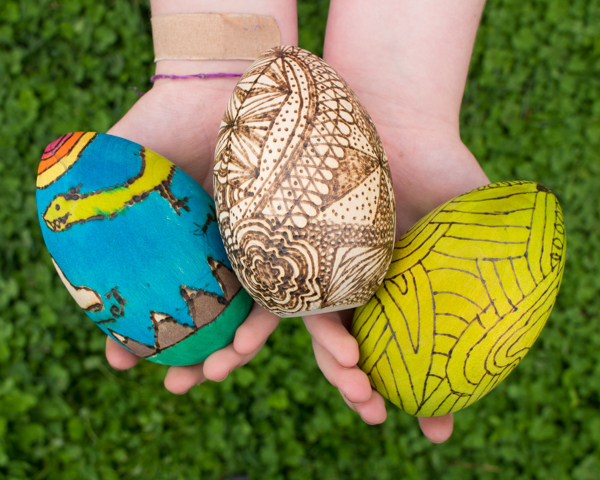 If they’re not already green, feel free to play with paint and stamps until they are! 23. Pot of gold necklace. I have a couple of these little jars leftover from a previous craft, so all that’s needed is to add an eye pin and a pinch of gold glitter in distilled water. 24. Rainbow fruit tray. This is the perfect treat to bring to a kid’s class party or to provide some healthy fiber and natural sugars at your own party. 25. Rainbow stacked hearts. Even very little ones can do all the painting and sorting of these hearts, but the sizing and texture of the cardboard is interesting enough that everyone can enjoy decorating and embellishing them. Are your St. Patrick’s Day plans suitable to reveal in a public forum? If so, tell me about them in the comments below. Bonus points if they involve DIY! Here’s a shout-out to my fellow VERY thrifty crafters! I like to do a lot of wax crafts, but beeswax is expensive, and lacking my own set of beehives, my budget can’t quite keep up with my habit. Fortunately, I also have a lot of jar candles around the house, some homemade (with more lovely beeswax!) and some gifted or store-bought (with various qualities of wax, but often most likely the cheapest). When these candles burn down there’s always still some wax left at the bottom and around the sides of the container. 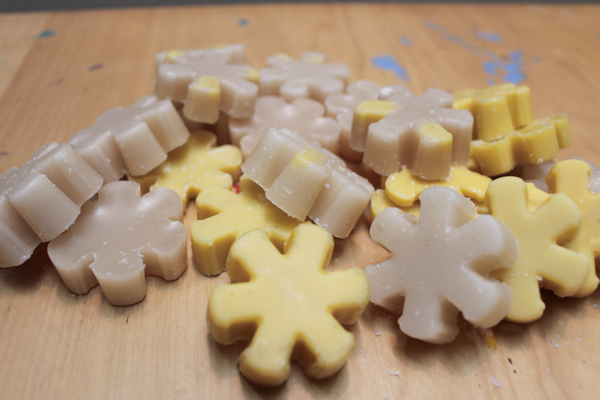 Reclaiming that wax is a simple process, and when I’m done, I have all-new wax to craft with! It’s worth it even to reclaim that cheap wax of unknown (but probably petroleum-based) provenance. You can use it to make fire starters, or dye it and use it to make wax seals. Perhaps you have an origami boat that you’d like to waterproof? The possibilities for reclaimed beeswax or soy wax are endless, of course, including remaking your own jarred or poured or dipped candles. And don’t forget that you can also reuse the jar that the candle came in! I’ll show you how to get it squeaky clean near the bottom of my post. *Save yourself some trouble and hit up your nearest thrift shop for the cheapest crock pot on the shelf, and then use it only for crafting. I bought this crock pot from Goodwill for $1.50 probably a decade ago, and it works perfectly for me and then lives out in the garage when I don’t need it. 1. Cover your work surface with newspaper, then ready your crock pot. Because I promise you that you do NOT want to spill melted wax all over your kitchen. Just… you really don’t. 2. Add the jar candle containers and water to the crockpot. Oh, if only it were so easy! So here’s the thing: those nearly empty jar candle containers are going to want to FLOAT, dagnabit. It’s super annoying, and also, you really don’t want to get water in the containers with the beeswax. What you have to do, then, is wedge the containers in so that they can’t float away. Setting a ceramic plate on top of them works well, as does filling Mason jars with water and setting them in the crockpot to take up all the rest of the available space. After everything is wedged tightly into place, all you have to do is turn your crock pot on and wait for the wax to melt. I like to pour the melted wax into silicone molds, not only because the wax slips out so easily when it’s cooled, but also because afterward, you have lots of manageable little blocks of wax that it’s then easy to melt again and use for all your projects. Often, your melted candle wax will have soot or wick fragments in it. If so, pour it through a layer of cheesecloth to catch the impurities. 4. Store reclaimed wax separately. It’s worth it to always store this reclaimed wax separately from your other wax stash. If you have no idea what type of wax you’ve reclaimed, you obviously don’t want to mix it in with your lovely soy and beeswax, but even if it’s soy or beeswax that you’ve reclaimed, you still don’t want to simply add it back to your stash. Reclaimed candle wax is fine for making more candles, but I certainly wouldn’t want to use it for the skin care products that I also make using beeswax. Now, what about those reclaimed jar candle containers? Even with the wax melted and poured out of them, you’ll notice that they’re still waxy. The trick to getting them squeaky clean is to completely immerse them, right side up, in a large pot of water. 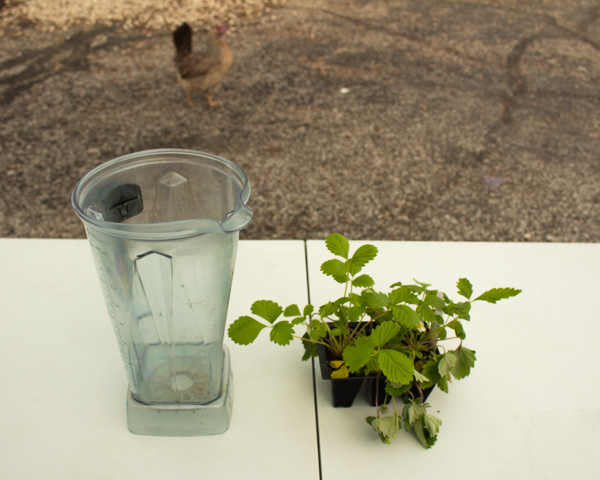 Make sure there’s plenty of water covering the top of the containers. 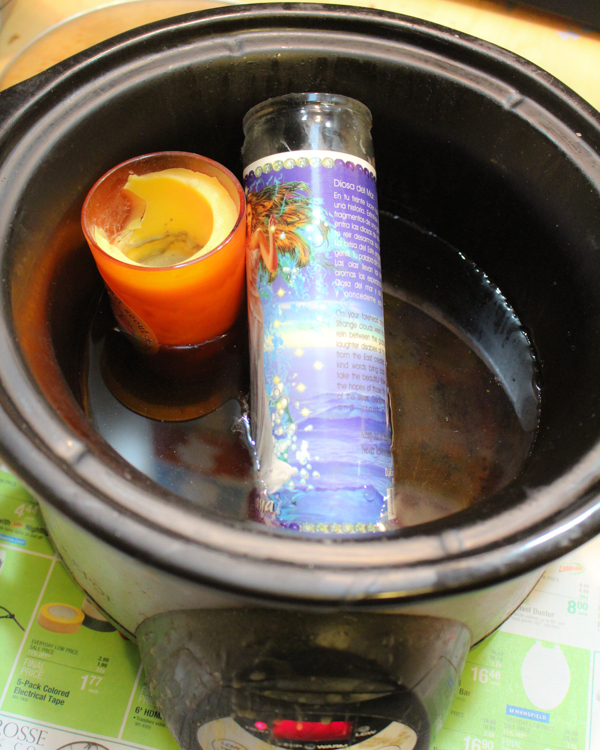 Heat the pot of water on the stove, and when the water temperature reaches the melting point of the wax that the candle containers once held, the remaining wax will melt and float to the top of the water. You have to play around with this method a bit and keep a good eye on the pot, because your wax of unknown provenance is going to melt at an unknown temperature, and if you have several candle containers in the pot, you’re probably going to be dealing with a different melting point for each of them. But when all the wax has finally melted and floated up to the top of the water, you can take the pot off the burner and let the water cool. Skim the solidified wax off of the cooled water and toss it, and then you’re free to check out your former candle containers. They’ll likely still be sooty and need a good scrub-up, but after that, they’re ready to reuse or upcycle. Might I suggest that you use them to make another jar candle? It’s not too late to give a handmade valentine to all your loved ones–especially not when you can pull the supplies right out of your recycling bin or front yard! 1. Seed paper valentine. 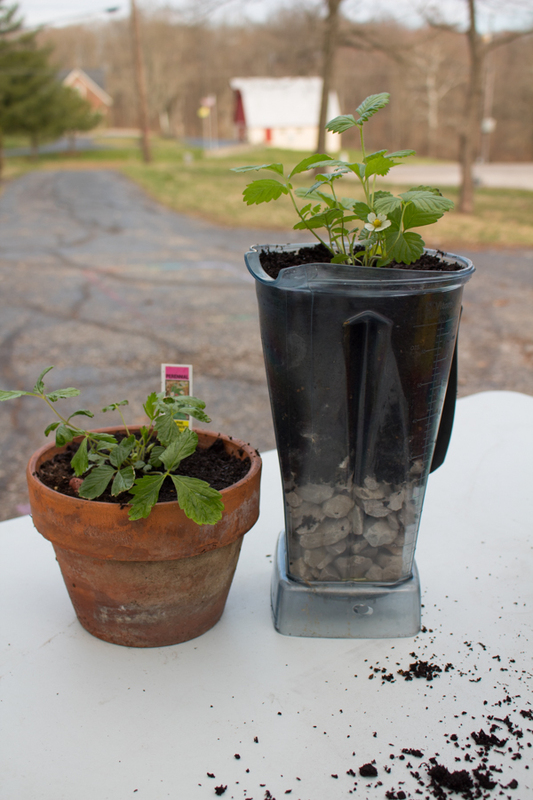 The best part of these valentines are that they’re plantable, so there’s no waste! 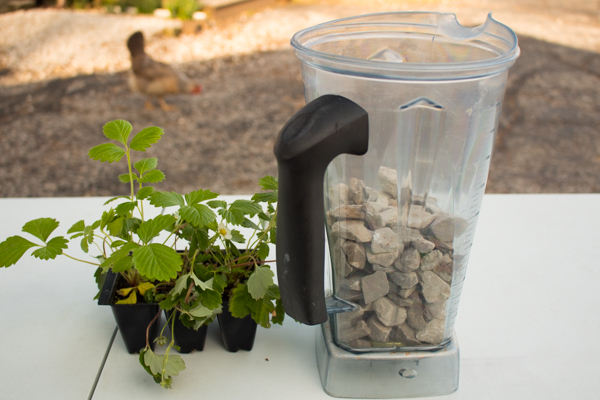 And don’t think that this project is only for Valentine’s Day–I think it would make a perfectly sweet gift for Mother’s Day or your favorite gardener’s birthday, too. 2. Fabric heart. This sewn valentine has a secret pocket to keep your love notes safe. 3. 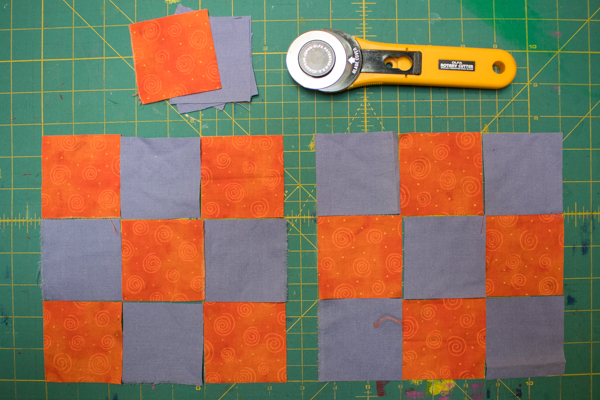 Custom-sized envelope tutorial. Don’t despair if your handmade valentine won’t fit into a store-bought envelope. 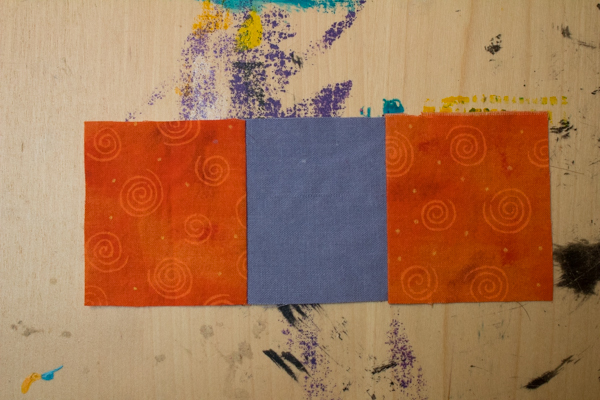 Making your own custom-sized envelope is easy! 4. Folded heart card. There’s plenty of room for a lovely love letter inside this card. 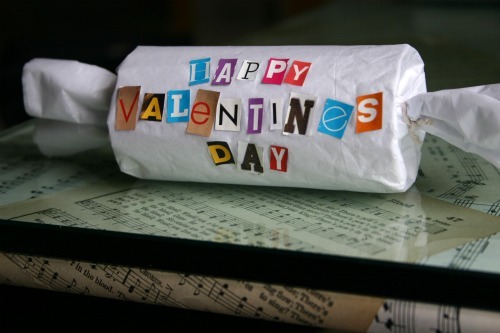 Be creative with the papers that you upcycle for your folded hearts–wouldn’t sheet music look lovely? 5. Toilet paper tube butterfly. These valentines are nice and big so that preschoolers can draw all over them. 6. Manila folder valentine with a bunting embellishment. If you’re the office worker type I bet you’ve got some of these lying around! 8. Cross-stitched hand warmers. These are more work than your average valentine, but still small enough to be able to mass-produce, and your recipients will think of you every time they use your valentine to keep their hands nice and toasty. 9. Embellished treat bags. Perhaps you have some treat bags left over from a previous party. Just a quick paint job makes them Valentine-themed, and then they’re useful again! 10. Yarn-wrapped cardboard heart. 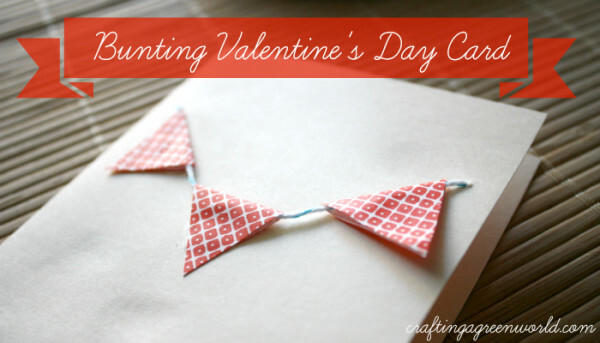 This project is a great way to help even the littlest littles make their own valentines. Let them wrap the cardboard heart willy-nilly, then tie on a gift tag with a ribbon. 11. “Cute As A Button” valentine. Got a bunch of buttons? Know somebody who’s just as cute as a button? It’s the perfect combination! 12. Crystal valentines. These take a while to grow, but they’re educational and fun, and nobody else will be giving away a valentine like them. 13. Toilet paper tube heart stamp. Use this DIY upcycled stamp to embellish plain paper for an instant valentine. 14. Felt heart pin. Felt, whether it’s natural wool felt or recycled Eco-fi felt, doesn’t need to be hemmed, making this project a LOT quicker. Don’t have felt on hand? Try fleece! 15. Newspaper heart valentines. You’d never know by looking at it, but newspaper takes paint like a champ and looks really gorgeous afterward. Try it and see! 16. Origami hearts. This is the quickest and easiest valentine on this list! 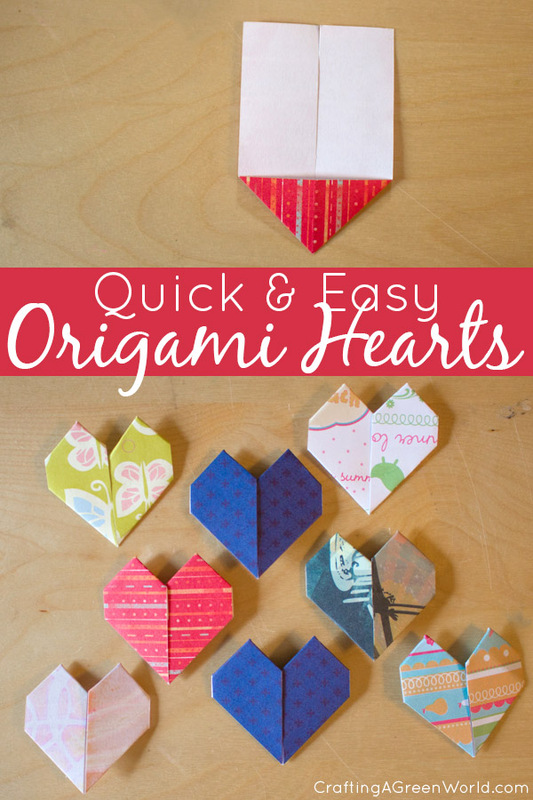 For a super simple valentine, simply size up your starting strip of paper, fold the origami heart, and sign your name on the back. 17. Fingerprint heart card. I’ve been really into upcycling old photos lately, and I think this project would be an awesome way to use up a cute old photo of your valentine. 18. Friendship necklaces. Instead of the plastic foam that the tutorial calls for, simply substitute cardboard or even stiff felt. 19. Mason jar lid valentines. 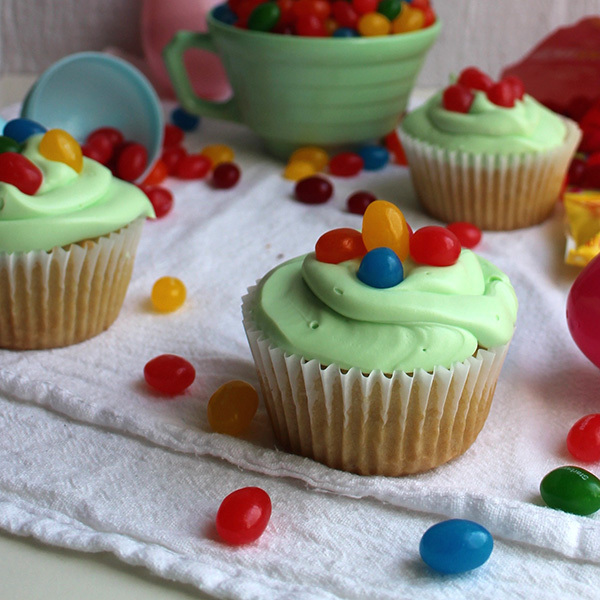 You don’t even have to attach these to a Mason jar full of treats–but you could! 20. A printable fortune teller. Print this on the back of anything letter-sized, whether it’s old artwork or stash scrapbook paper. 21. Puzzle piece valentine. These valentines work best with the larger size of preschool puzzle pieces. If you make valentines out of small puzzle pieces, just put each valentine in its own small envelope so that the pieces don’t get lost. 22. Fingerprint heart friendship rocks. 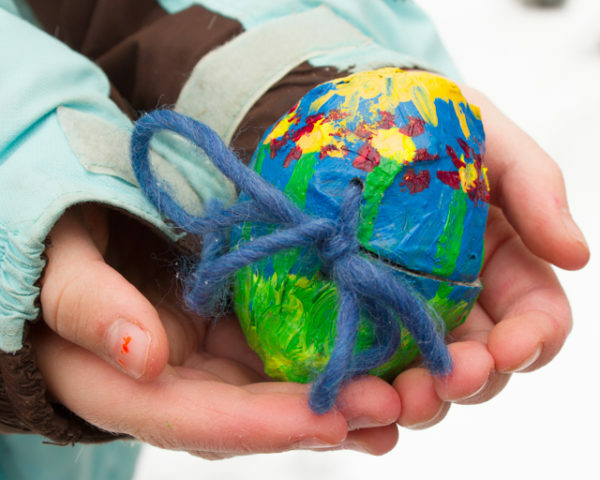 Give kindness rocks a new twist by turning them into valentines! 23. Map roses. 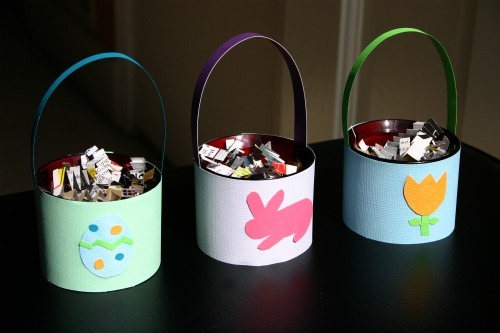 Make these in bulk, then use washi tape to add a gift tag to each stem. 24. Puzzle heart. Here’s another puzzle piece valentine! Instead of simply cutting the photo into a puzzle piece shape, why not decoupage it directly onto an old puzzle piece? For bonus points, glue a magnet on the back! 25. 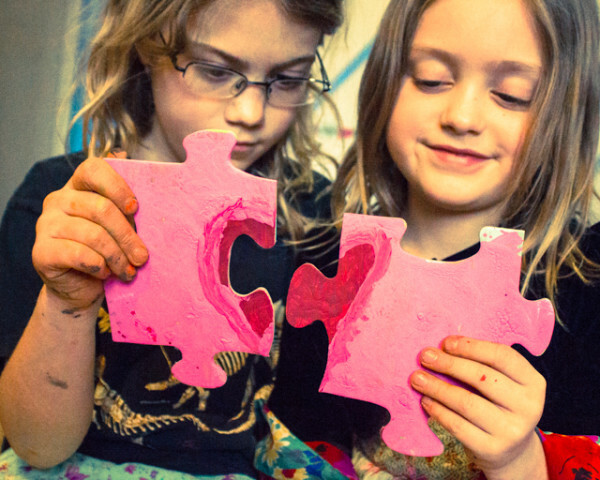 Puzzle piece and popsicle stick valentine. Oh, my goodness, I am finding so many good puzzle piece valentines! This one is a good way to upcycle lots of old puzzle pieces at once. 26. Toilet paper roll valentine. Here’s a fun gift container that’s perfect for a small toy or piece of packaged candy. 27. Coloring bookmark valentine. Use up all those ribbon scraps or yarn bits for these valentine bookmarks that recipients will love to color themselves. 28. Paper airplane. This paper airplane valentine is a free printable, but it doesn’t need to be. I know you know how to make a paper airplane! 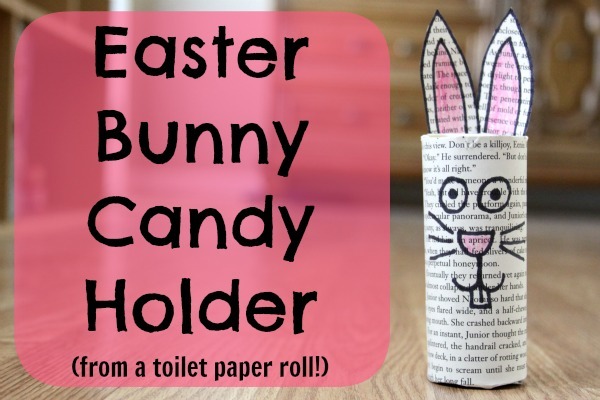 Just add cute paper and a stamped message. 29. Puppy love valentine. Little ones can make these valentines while practicing their cutting and coloring skills–AND there are googly eyes involved! 30. Thumbprint heart glass magnets. Here’s something a little different for the valentine mailbox. The glue takes a while to set, but the magnets themselves are quick and easy to make. 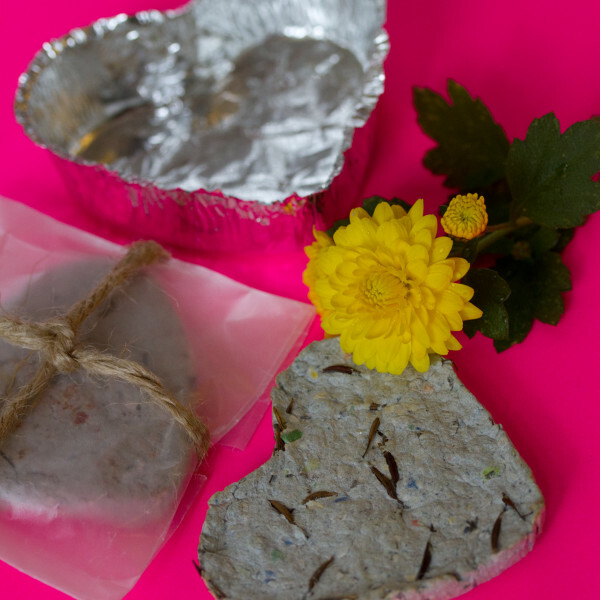 Have a great eco-friendly valentine idea of your own? Tell me about it in the comments below! It worked! 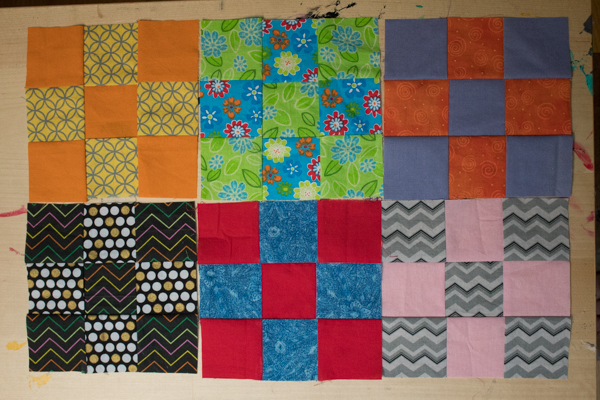 I’m going to buy more elastic and make a couple more!